BlongoBalls can be used either indoors or outdoors and played with in any way the athletes feel fit. This set includes a blue, green, purple, red and yellow ball. Each BlongoBall has a nylon rope attached. 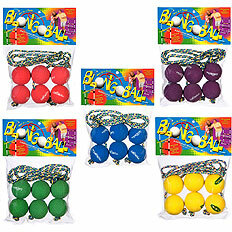 BlongoBall rubber ball sets are specially designed for indoor play but also are great sellers for youth participants. Younger children can play the game without the worries of using the BlongoBall hard ball sets. These solid rubber balls made from E.V.A. are the same size as the company's hard balls. They are great for schools, community centers, physical therapy and more.